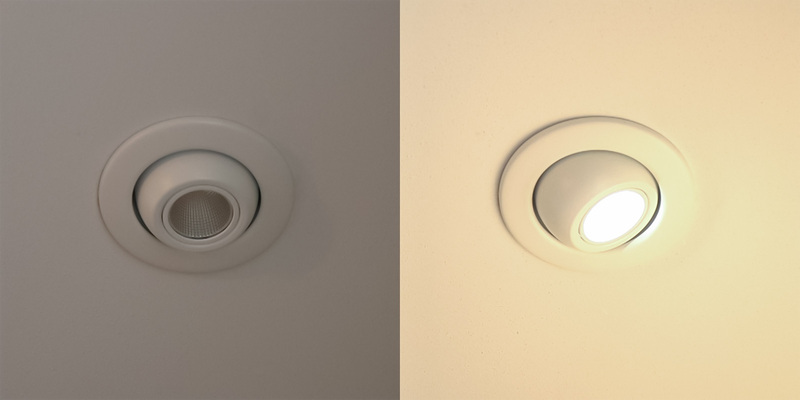 LED Can Light Retrofit for 4" Fixtures - 10W LED Eyeball Can Light Conversion Kit: Shown On In Warm White (Top) And Cool White (Bottom). 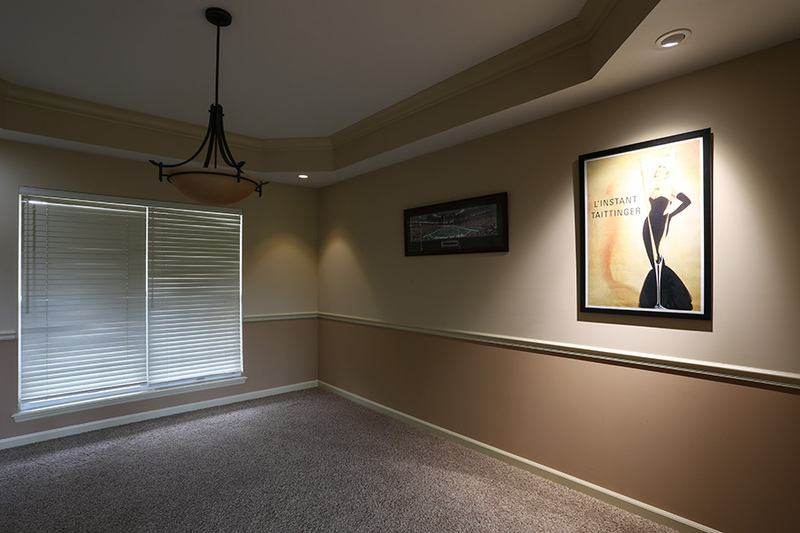 LED Can Light Retrofit for 4" Fixtures - 10W Gimbal Can Light Conversion Kit: Shown Installed (Right) And Illuminating Art. Comparison To Standard 4" Can (Left). 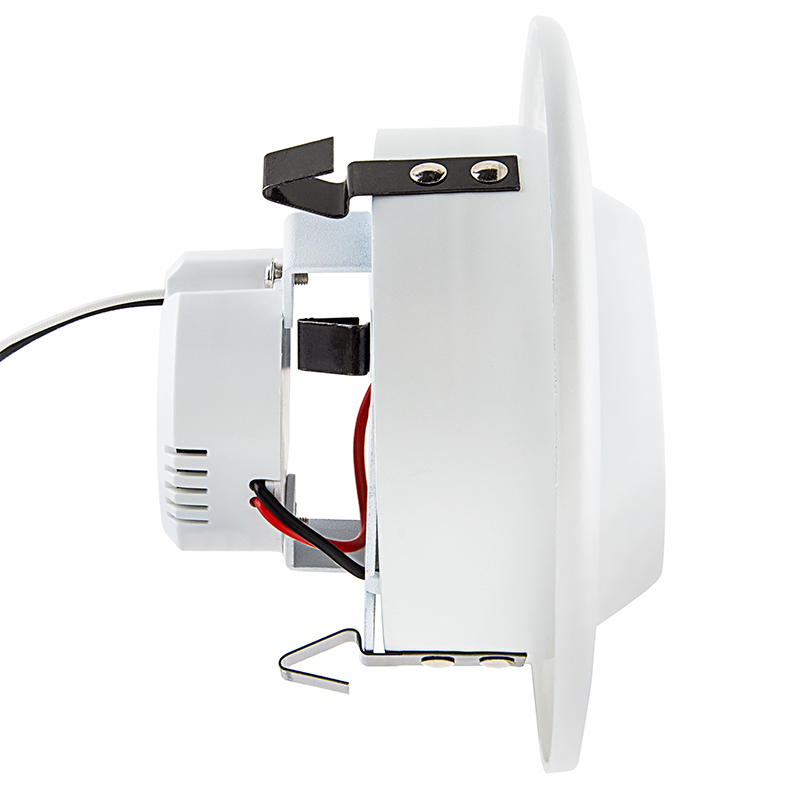 LED Can Light Retrofit for 4" Fixtures - 10W Gimbal Can Light Conversion Kit: 360° View. LED Can Light Retrofit for 4" Fixtures - 10W Gimbal Can Light Conversion Kit: Shown Illuminating A Plant. 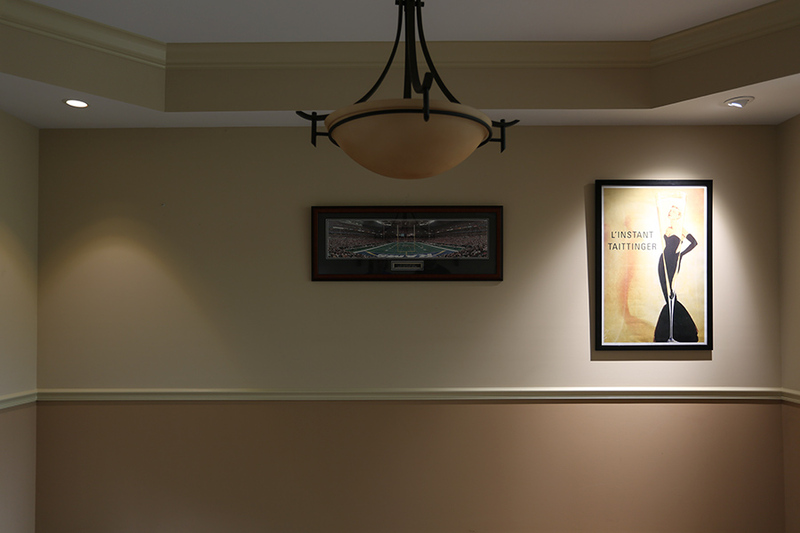 LED Can Light Retrofit for 4" Fixtures - 10W Gimbal Can Light Conversion Kit: Shown Installed (Right) And Compared to Standard Incandescent (Left). 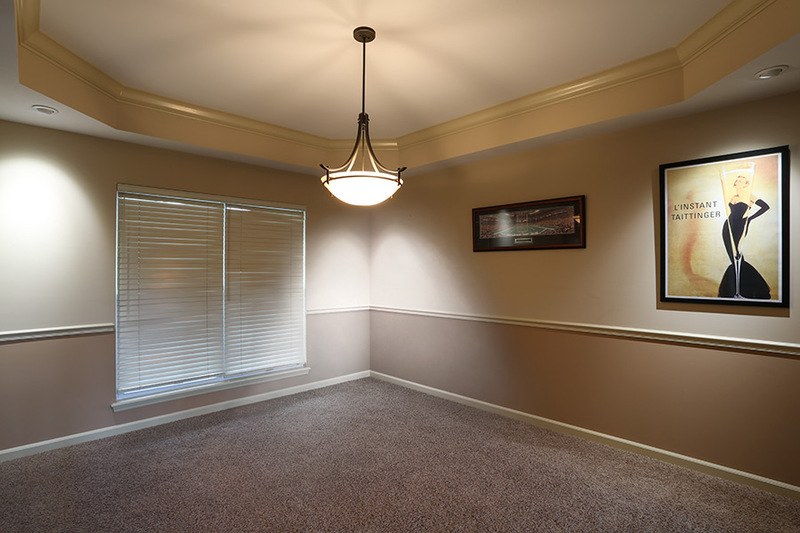 LED Can Light Retrofit for 4" Fixtures - 10W Gimbal Can Light Conversion Kit: Shown Installed In Ceiling Fixtures And On. LED Can Light Retrofit for 4" Fixtures - 10W Gimbal Can Light Conversion Kit: Showing Light Installed And On. 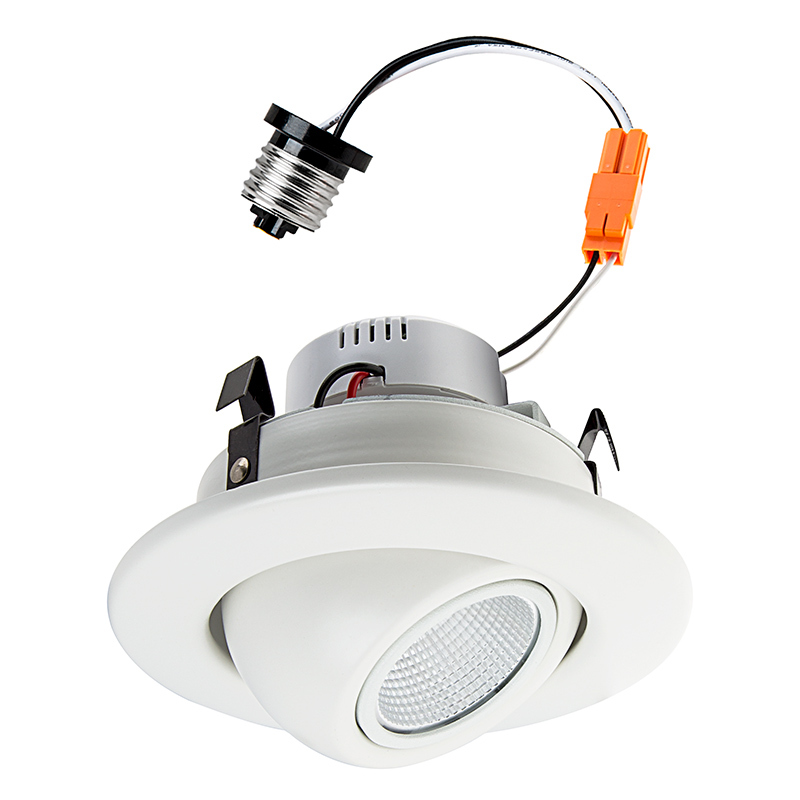 LED recessed lighting kits are designed for residential and commercial ceiling down lighting. 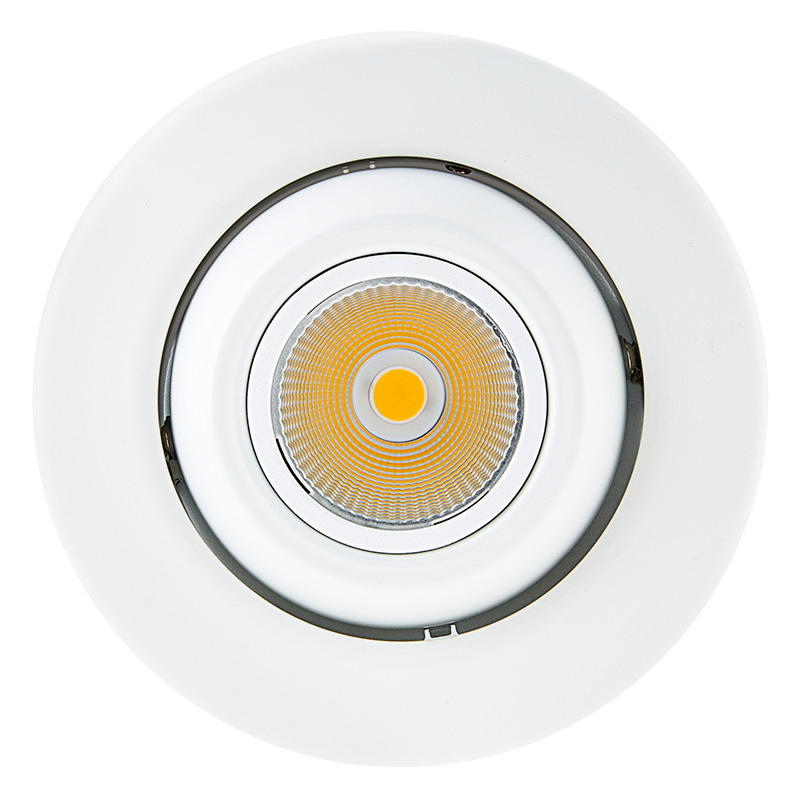 Use this LED downlight for kitchen lighting, bathroom lighting, living room lighting, basement lighting, office lighting, and more. 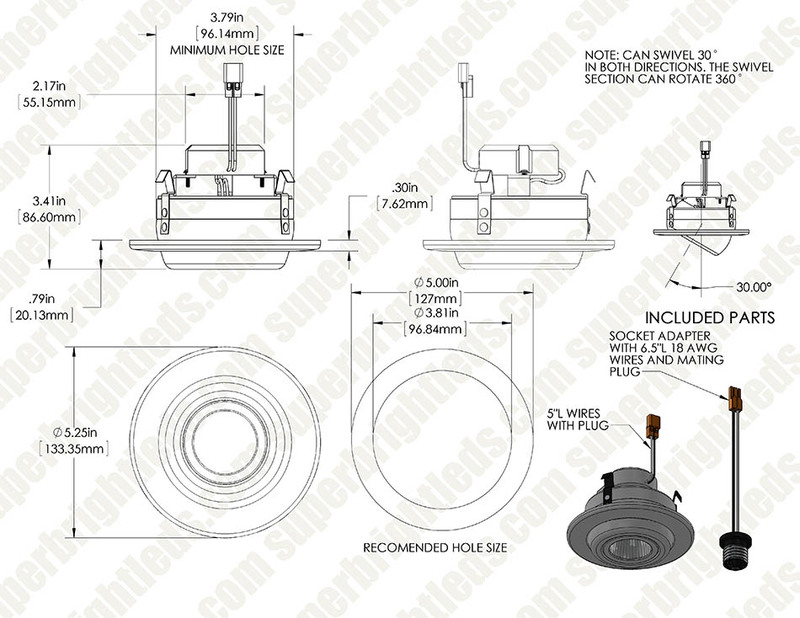 Retrofit existing 4" recessed can light housings or use with any 4" can for new construction applications. 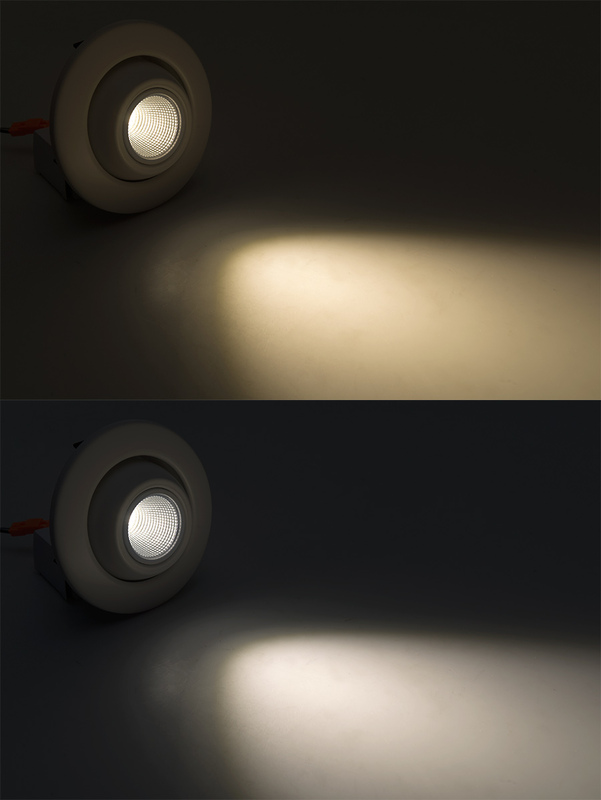 Pivot and rotate the aimable LED eyeball light for illumination where you want it most. This LED high hat light has 1 cool-running COB (chips-on-board) LED that emits up to 750 lumens. 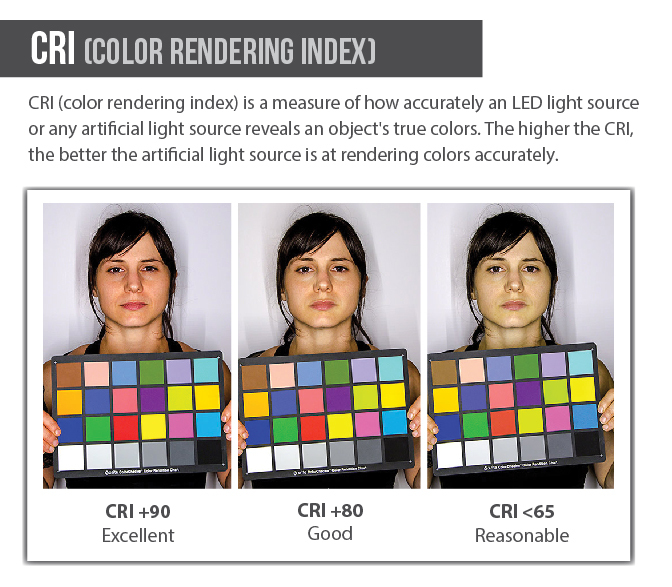 And with a high CRI (color-rendering index) of 90, the white LED reveals the true colors of any object or surrounding. 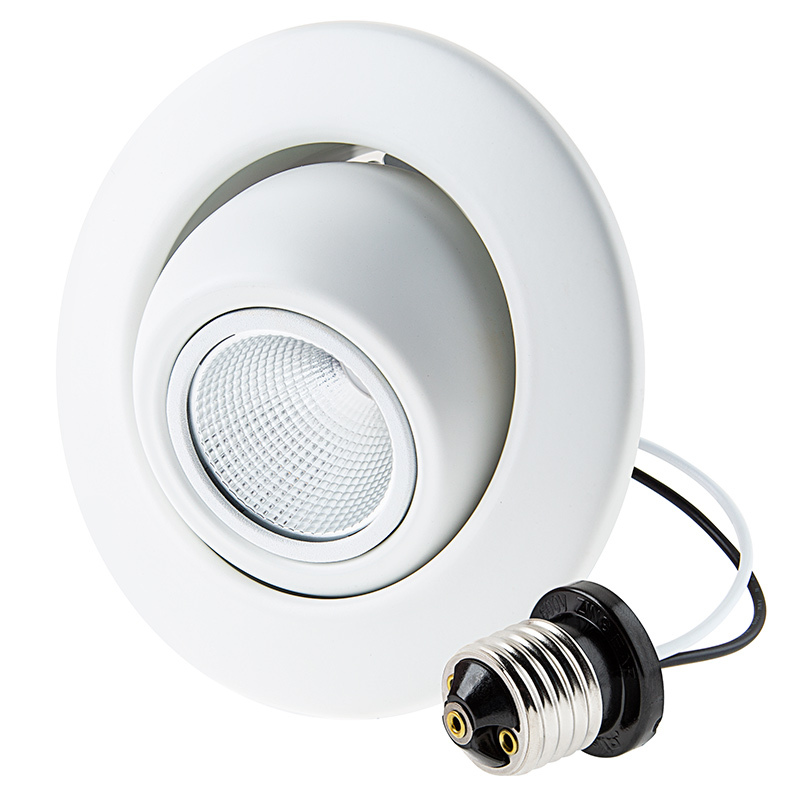 The UL-Classified LED light is suitable for installation in compatible recessed housings and follows the guidelines of California Title 24 Part 6, Building Energy Efficiency Standards. 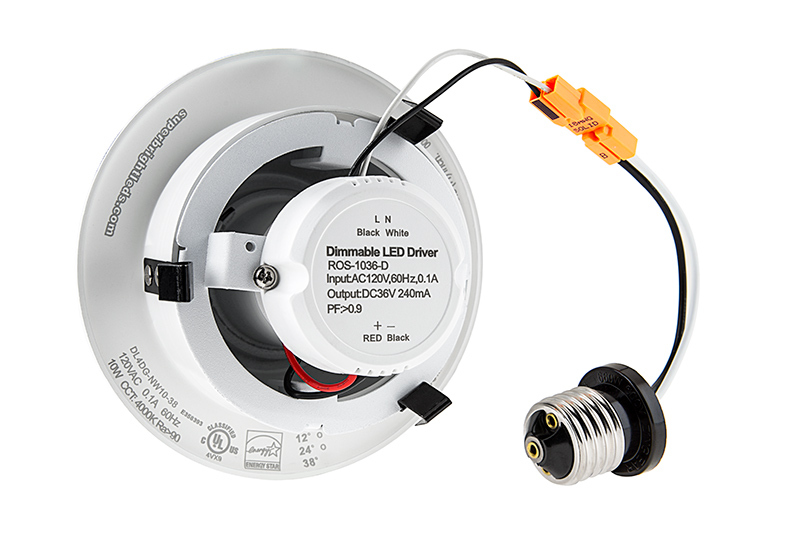 Includes an E26/E27 Edison screw base adapter and a dimmable constant-current driver. 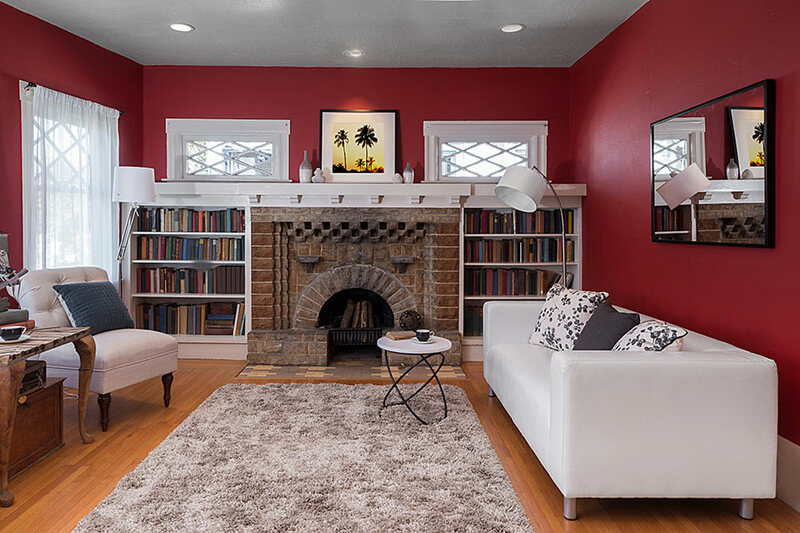 Available in Natural White or Warm White. Also see 85-watt equivalent and 150-watt equivalent versions. Underwriters Laboratories (UL) LLC is an independent testing agency that works to verify product safety and quality. UL tests specific properties of product samples to ensure that they adhere to applicable UL requirements, Standards for Safety, and other national and international organization's standards. 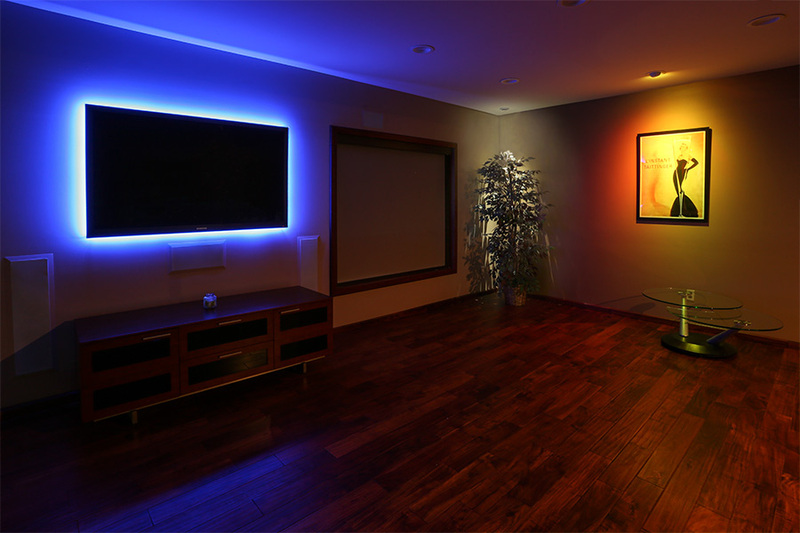 This is a great product, decent CRI and good color. 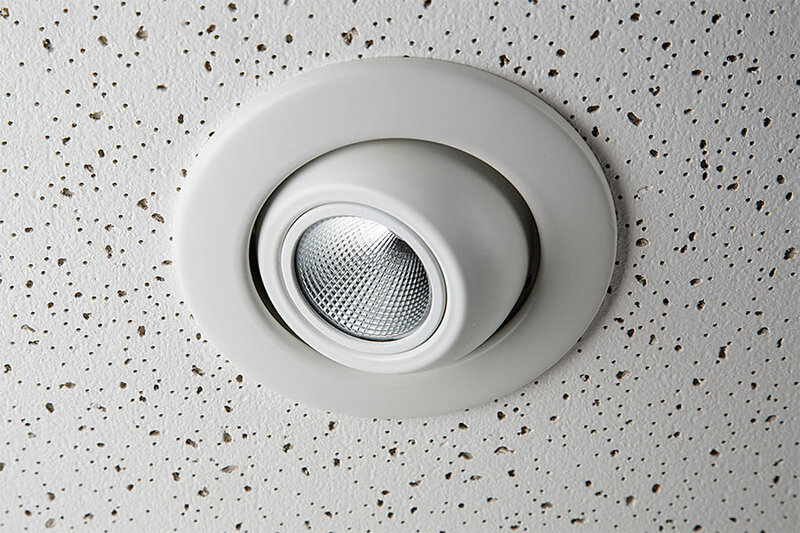 I do not have any recessed 4" cans for which they are designed, but I have retrofit track light cans, and they are easily disassembled to make a custom fixture. I use these custom fixtures for uplighting on vaulted wood ceilings, with excellent results. I have purchased quite a few. I just got 4 of these to replace some halogen spotlights in my kitchen. Easy install, looks better than the old halogen fixtures. Much brighter, with a good spotlight pattern. I had 50W Halogens before and these are dramatically more light! Installation takes just a couple minutes, most of which was adjusting the aim to exactly what I wanted. I would have preferred a 3000K color, but the daylight color is OK for the spotlights. THIS IS A WELL MADE DEVICE WITH A BRIGHT LED. GREAT FOR BATHROOMS.